Aesthetic Blasphemy: All in a game. everything to be all right. short, intellectual and a good play with words! and I agree really apt snaps for the topic! and i love the photos..
Short but so true and thoughtful ! beautiful and deep lines..loved them! u've got an entire story spun in just 6 lines.. an ocean of emotions yet simple..
if only it was easier to forget than to pretend.. Isn't it worth living by? Optimism. I could create reality too, it's the play of the will. It is, just play along, dance to the good tune. Loved the lines and the images are just soo apt! n i love d frst pic. is it a post inspired frm d pic or u wrote n den found it? Strange, why? I mean, why not? the apples are soooo cute and so does your words.. Play the game and forget that we are in game? The pictures and the thought compliment each other so well. 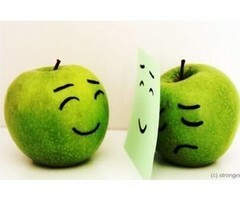 Cute and apt images and lines so true!! Did you get this thought after seeing those pics or you chose those pics after getting that thought? Cute pics! :) Nice words. :) Enjoy reading it. Was it a dream? : Interesting and unique experience. :) U are lucky! It's almost like a labyrinth of words!!! :) I like the way you have played with it. 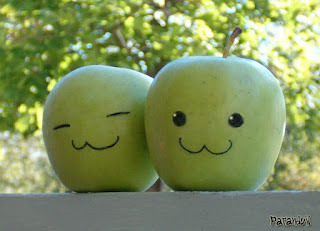 and I doubt I can eat apples after this... they seem so cute and lifelike!!! :) I enjoy reading your blog!! Sorry for having missed out your comment. Thank You. And as I said to Solitaire, let's not pretend. well nice read...with nice thought provoking message..
Pretend everything is all right and then forget ... this can become a fantastic talisman. Simplicity is the most beautiful virtue..and your 6 simple lines expresses deep emotions. Great piece of work...! wish it was that easy!!! wonderful lines.....let us be oursleves !! nicely written,and the cute pics to compliment it!! keep penning! Couldn't have come at a better time :) Great read! aahh..eemmm..What should I say? Your few words have said everything...Aesthetic indeed! :) That wouldn't be much different. I bookmarked this page, just because I had to. Nice msg and apt pics. Haste! lest while you're lagging. Hmmmm..... (in a thoughtful way). Interesting word play. Beautiful, frail, and always convincingly unconvincing reason from a mind to the heart. Thank You, and welcome here. Thoughtful. Led to train of thought. Yes, small packages of joy. With nice illustrations, lines that mean deep. It is said that if you change ur physical posture, and do something playful, your mind adjusts to that activity and u can forget about ur pain for the time being. btw, ever played with a balloon.. hitting it up like a ball?!!!! Brilliant! Seriously. :) I love the pic too, its so cute. Every thing is perfect. you are right in your way. I like above the picture. maybe too late to post this - but i reached here only now, blog-hopping!! and perfect pic to go with the simple, profound words!